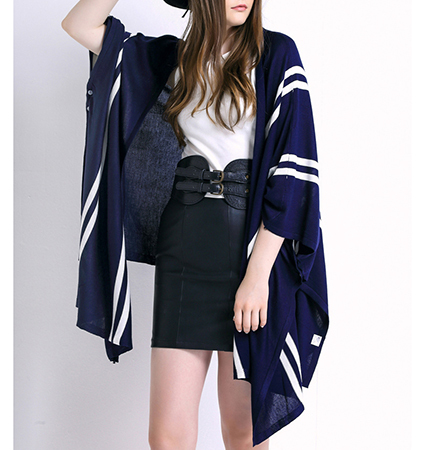 This women’s kimono style duster is one of our most popular lightweight wraps. It is elegantly designed in solid black and white with strategically placed stripes for a dramatic impact. This is a knee-length wrap that is loosely fitted and flowing. It features wide kimono sleeves with dropped shoulders. The fit is loose and free flowing. The garment was intended to be open in front, and has no buttons or zippers. The neckline is collarless. We recommend dry cleaning only for this kimono duster. It comes available for purchase in sizes Small, Medium, Large and Extra Large.